Situated among the glorious mountains of Big Bend, Alpine is a friendly small town with much to offer. Whether you’re searching for murals in its historic downtown or watching the local baseball team, you’ll find there’s a lot to love about this West Texas getaway. Better yet, Alpine is an easy drive away from some of the biggest draws in the Big Bend region, opening up a world of possibilities beyond its city limits. Read on to discover the many attractions in Alpine. 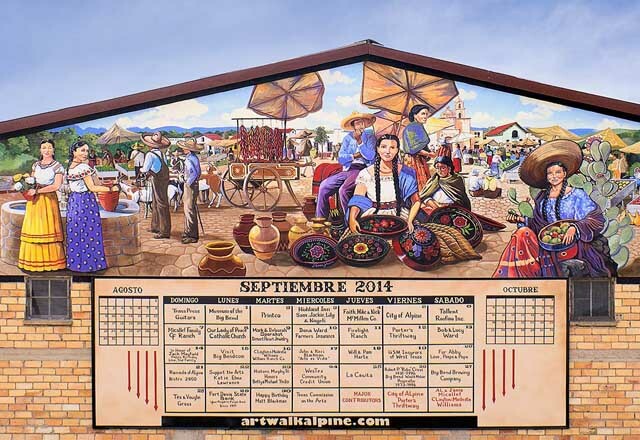 Alpine’s stunning landscapes and vibrant wide-open sky have long inspired artists, some of whose work you can see in the form of colorful murals throughout the downtown area. Go for a stroll to see these paintings, each showcasing elements of local history and folklore. For a breathtaking view of the desert valleys and mountains that surround Alpine, climb to the top of Hancock Hill. Follow the scenic hiking trail to the top and you’ll encounter The Desk, an actual desk that three Sul Ross State University students hauled up in 1981. Have a seat and leave your name in the notebook to be a part of local lore. Get an up-close look more than 40 of Alpine’s historic buildings on this walking tour of the downtown area. Step into the past as you wander past homes and churches built in the late 1800’s, as well as storefronts constructed in the early 20th century. Catch an Alpine Cowboys game at Kokernot Field, a vintage 1940’s era stadium once called “The Best Little Ballpark in Texas” by Sports Illustrated. The Cowboys take on the rest of the Pecos League from May through July. Located on the campus of Sul Ross State University, the Museum of the Big Bend showcases the cultures and history of the region and the people who have called it home. Exhibits show what life was like, from the Native Americans who lived in the area for thousands of years before any Europeans arrived, the Spanish, and the pioneers who settled the frontier. Along with these displays, the museum features Western art and the Yana and Marty Davis Map Collection, a compendium of historic maps dating back to the earliest days of exploration in the new world. Take a stroll through Sul Ross State University, home to one of the prettiest small campuses in Texas. Founded in 1917, the university is where you’ll find the Museum of the Big Bend. Sprawled across a vast stretch of mountainous terrain near the Texas-Mexico border, Big Bend Ranch State Park offers an escape to the Lone Star State’s wild side. Explore desert valleys and mountain peaks on 238 miles of hiking, biking, and horseback riding trails or on 70 miles of unmaintained dirt roads in four-wheel-drive vehicles. A variety of campsites offers up a chance to see all the big and bright stars of the wide-open sky once the sun sets. Thanks to its stunning natural beauty, Big Bend National Park is perhaps one of Texas’ most well-known attractions. Take in its stunning cactus-covered valleys and its breathtaking canyons and mountains as you drive or hike through the remote park. Big Bend is also a major destination for birding, kayaking on the Rio Grande River, scenic driving, and stargazing. Get to know the diverse flora and fauna of the Chihuahuan Desert, and enjoy some truly jaw-dropping views, as you stroll the trails at the Chihuahuan Desert Nature Center in Fort Davis. These earthen paths take you into canyons and up to the top of a 220-foot-tall hilltop that affords a 360-degree view of the area. The nature center also has exhibits showcasing the culture, history, and geology of the area, as well as a bird blind for birding enthusiasts. Perched high in the mountains of West Texas sits an oasis of spectacular beauty and endless adventure. Take in all the breathtaking vistas as you hike, mountain bike, or ride horseback along miles of rugged trails. Visit the interpretive center to learn about birding in the area, and spend the night in a primitive campsite or at the 39-room lodge to sleep under the stars. Get an up-close look at massive research telescopes and learn about our universe when you stop by the McDonald Observatory. Perched high in the Davis Mountains, the observatory is home to a museum that offers daytime guided tours and solar viewings, as well as special viewing nights when you too can see the stars.